Extensive loss of skeletal muscle tissue results in mutilations and severe loss of function. 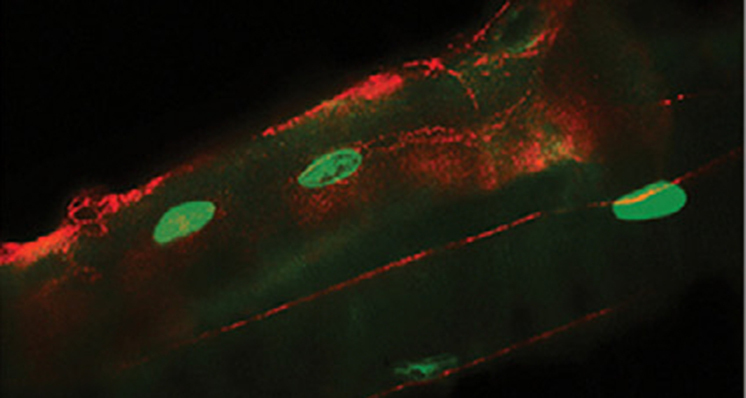 In vitro-generated artificial muscles undergo necrosis when transplanted in vivo before host angiogenesis may provide oxygen for fibre survival. Here, we report a novel strategy based upon the use of mouse or human mesoangioblasts encapsulated inside PEG-fibrinogen hydrogel. Once engineered to express placental-derived growth factor, mesoangioblasts attract host vessels and nerves, contributing to in vivo survival and maturation of newly formed myofibres. When the graft was implanted underneath the skin on the surface of the tibialis anterior, mature and aligned myofibres formed within several weeks as a complete and functional extra muscle. Moreover, replacing the ablated tibialis anterior with PEG-fibrinogen-embedded mesoangioblasts also resulted in an artificial muscle very similar to a normal tibialis anterior. This strategy opens the possibility for patient-specific muscle creation for a large number of pathological conditions involving muscle tissue wasting.